Greetings! We had a packed week of learning in the cottage this week. Everything from QR codes and math word problems to geography and the continents on which we live. Shew. This teacher was TIRED when Friday night rolled around, but we had so much fun! Here is a little recap of what we did. As I mentioned in a previous post, we are really stepping it up and adding a lot of science and social studies into our reading curriculum this year. That means making the curriculums blend into one another as often as possible. I am really excited with how well everything has been going, and the students are learning so much in the process. 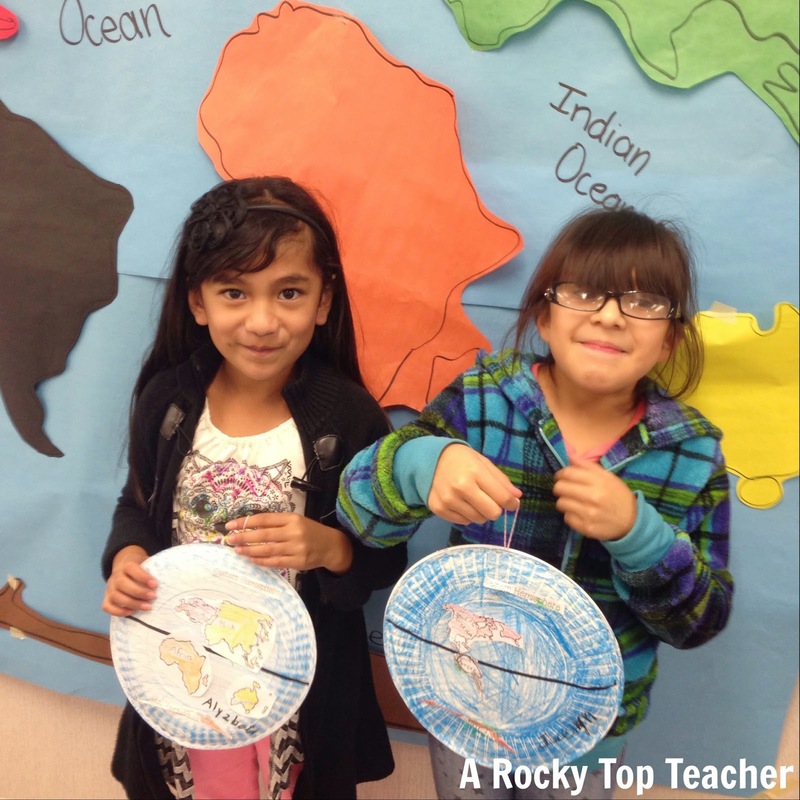 This week, we began our two week unit on Geography. 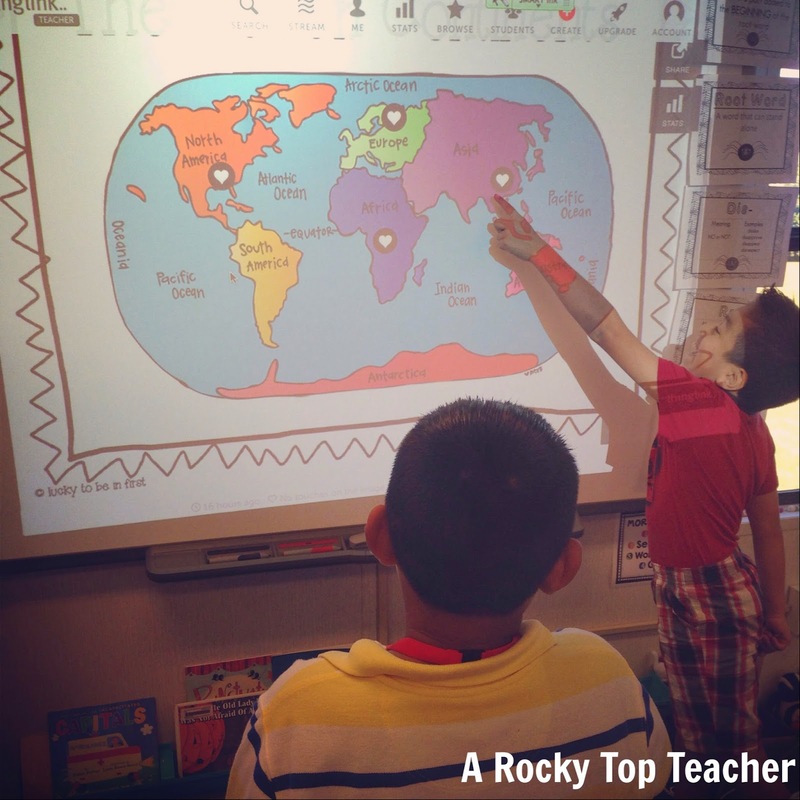 We talked about the continents, map keys, compass rose, equator, and hemispheres. On Monday, the students spent time exploring the names and important facts of each of the seven continents.We started the entire unit off by creating a KWL chart on continents. We had one fact for the K section, and the students struggled to list any questions or comments that they had for the W section of our poster. I was totally okay with that because it meant that most of this unit would be entirely brand new to the students. We learned a song on the continents. You can view a snippet of it here. I cut out life size posters of each continent and placed them around the room. 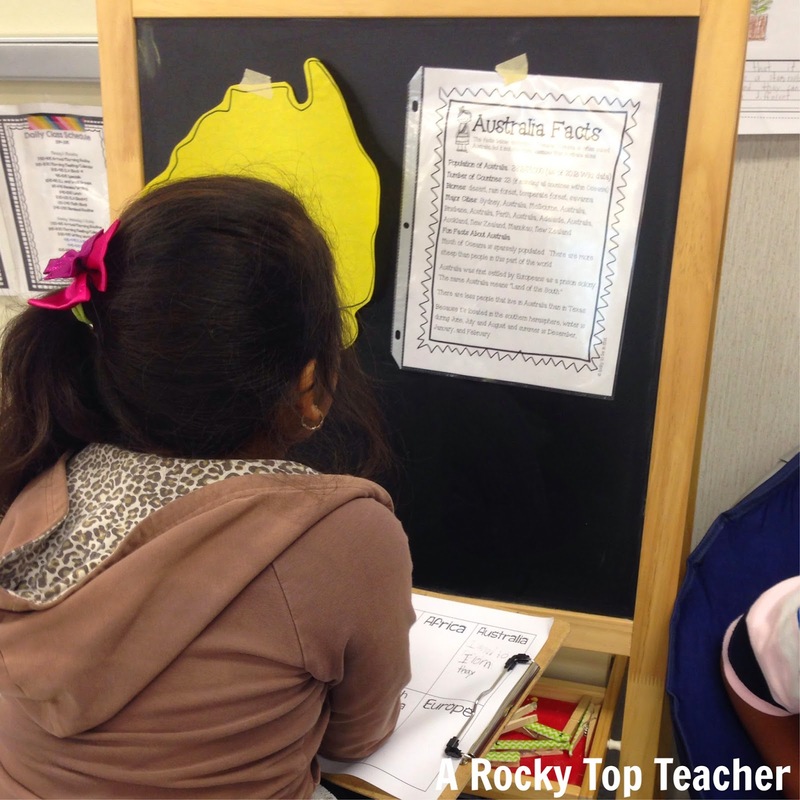 I also used fact sheets from Lucky to be in First's awesome unit on the continents to help students build a foundation of knowledge for each continent. Next up was our ThingLink activity. 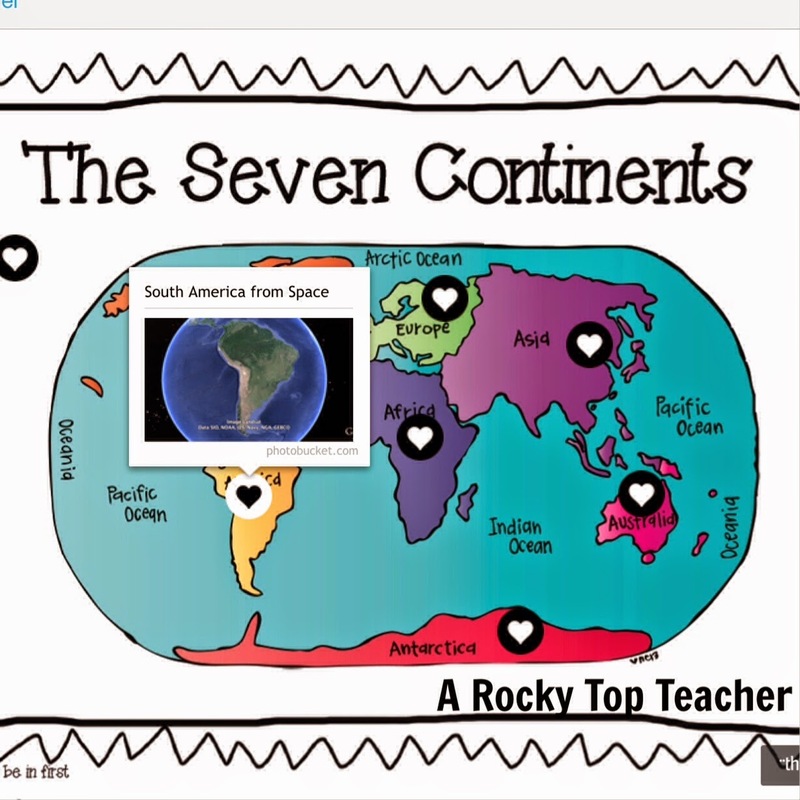 Students spent two days exploring different Thinglink tasks centered around the continents. Our reading comprehension skills this week were problem/solution and making predictions with fables. Students used the Thinglink to explore different fables from around the world. Midway through the week, one of my students wanted to add a new question to our KWL chart. She asked me what the continents looked like from space. I was floored at how awesome of a question that was, and I told her that I would somehow show her the answer to her question. 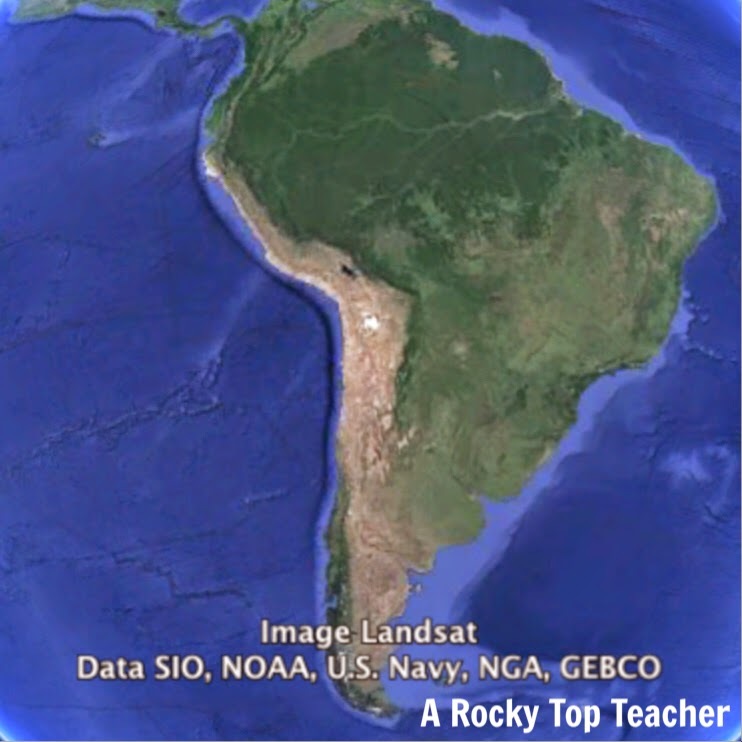 The next day, I walked in with a ThingLink for students to explore in our continent centers. This might be one of my favorite ThingLinks that I have created so far. The students could click on the "hot spot" hovering over each continent to see a direct view of what the continent looks like from space. I also had a hot spot embedded in the upper left corner of the image. This hot spot would send students to a general page where they could move the globe all around and look at the globe in 3D. Students noticed that some continents had different colors on them so we discussed that white represented ice, blue was water, green was area with dense vegetation, and brown meant desert or extremely dry areas. Students would also find a continent and then refer to our life size world map to try to figure out which continent they were looking at. We wrapped up the week by reading some rigorous informational text from TN Core. I knew that the passage on oceans would be challenging so students read it in groups. The passage covered everything from the names of the five world oceans and their locations to the water cycle. I had a proud teacher moment when students left for the afternoon. It was raining and a student exclaimed, "Look! It is raining water from the ocean!". It just goes to show how very important it is to expose our students to text. They DO apply the information to real life! Students also applied their understanding of the 7 continents and 5 oceans, the equator, and the 4 hemispheres by making a paper plate replica of the world. Here are two cuties showing off their work! We have another exciting week ahead! Students will be writing their first informational paper about Christopher Columbus. We just started geography in 3rd so the Thinglink will be perfect. Thanks for sharing that! We also just finished the Water Cycle in Science so that Oceans article will work so well. You gave me great ideas. Thanks!